Posted by VU Managerial on Tuesday, April 26, 2016 in News. In business, ultimately, it’s all about who you know. Through a partnership with Owen Business school’s Women’s Business Association (WBA), and by utilizing the strong Nashville community, Vanderbilt Women in Business (WIB) will provide opportunities for undergraduates to develop their networks. Our mission is to empower the next generation of leaders by engaging a network of successful and ambitious women. Young women will learn from experienced businesswomen and build connections that will serve them throughout their careers. WIB began merely as an idea in October of 2015 when the President of WIB, Sasha Pines, noticed a lack of female participation in the entrepreneurial community on campus. As she continued to attend entrepreneurial events by the Vanderbilt Innovation and Entrepreneurship Society, as well as Vanderbilt Entrepreneurial Network workshops, she consistently noticed that the women in the room were starkly outnumbered by the men. While Sasha’s passion resides in entrepreneurship, she quickly discovered that there was a larger demand for a women’s organization geared towards business rather than entrepreneurship. Upon further research, she found that Vanderbilt was one of only three top 15 universities (as defined by U.S. News National Universities Rankings 2015) that did not have a registered undergraduate organization that supported female businesswomen. The WIB board is most excited to take advantage of Nashville’s collaborative community by reaching out to all the inspirational people in the Nashville community that are so willing to help students. “One of my favorite parts of Nashville is the strength of the community,” said Sasha. “I can cold-email almost anyone in the city asking to grab coffee, and more often than not, they will say yes. We want to become the liaison between Nashville’s businesswomen and Vanderbilt students looking for guidance in the business world.” WIB will help initiate those conversations by reaching out to Nashville’s business community and providing a space conducive to forming those connections. To combat this problem, Sasha called upon the aid of her boss, Chris Gerding, a local entrepreneur who runs a startup called Boomalang, an online language exchange platform. Gerding graduated from Vanderbilt’s Owen Graduate School of Management and connected Sasha with the former president of Owen’s WBA, Imogen Roberts, which is how the Vanderbilt’s undergraduate Women in Business organization’s partnership with Owen’s Women’s Business Association began. Through this partnership, WIB will provide networking and mentorship opportunities for female undergraduate students. Ultimately, WIB’s network consists of business school students, Vanderbilt’s Alumni Association, and businesswomen throughout Nashville. WIB held its first interest meeting and panel, sponsored by the Managerial Studies Program, on Tuesday, March 29th. Panelists included Amy Tanksley, Kimberly Lexow, Jessica Bialas, and Carroll Kimball. Topics of conversation ranged from mentorship, habits that lead to success, networking, and patterns of women in the workforce. 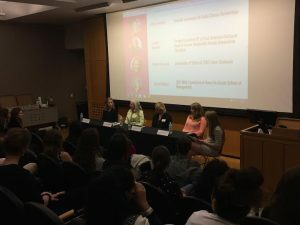 WIB strives to connect undergraduate women with a network of established businesswomen that encompasses a wide array of perspectives, which was evident throughout the panel discussion. When posed with the question, “What habits do you attribute to your success?” Carroll Kimball, a former executive vice president at First American National Bank and former Vanderbilt Alumni Association president, drew on her adaptability and willingness to develop new interests to connect with coworkers. Kimberly Lexow, who graduated from Owen Graduate School of Management in 2007 and co-founded Sifted, a company that focuses on experiential lunch programs for tech-centric brands such as Lyft, Emma, and Yik Yak in Nashville and Atlanta, countered that one of her preferred attributes is accepting her mannerisms and not redefining herself to fit a culture. Amy Tanksley, founder and owner of Uncle Classic Barbershop, shared her story of losing her first job just a few months in, concluding that “some of the best things that will ever happen are things that are not planned,” and to be ready when those things happen. Jessica Bialas, a 2017 MBA Candidate at Owen Graduate School of Management, related to undergraduates by acknowledging her continuous search to find her career path and the benefits of business school as a means of discovering your passions and building a skill-set to be successful in business endeavors. Because undergraduates’ relationships with businesswomen is such an integral part of our mission, WIB will primarily focus on networking and mentorship programs. Beginning Fall 2016, WIB will host a kick-off event organized by the Vice President of Community Engagement, Clee Malfitano, to introduce students to the program and to encourage involvement. WIB will continue to host kick-off at the beginning of each following semester, where prominent speakers will address topics relevant to the surrounding community. After the kick-off event, WIB will host lecture series events once a month organized by the Vice President of Programming, Mary Win Anderson. These events are open to all members of the Vanderbilt community and invited guests. WIB will also offer a mentorship program, which will only be open to premium members. While general members are welcome to participate in the monthly lecture series and the kickoff event, there will be a short application process to sign up for the mentorship program and have access to networking events. These events, organized by the Vice President of External Relations, Joanna Cheng, will be hosted twice per semester. All events will be advertised through Facebook (https://www.facebook.com/vanderbiltwomeninbusiness/?fref=pb&hc_location=profile_browser), Instagram (@vanderbiltwib), and email run by Vice President of Marketing, Sloane Chmara. If you would like to be added to the mailing list, join the WIB organization on anchorlink (https://anchorlink.vanderbilt.edu/organization/WomeninBusiness). If you are interested in sponsoring our program, please contact WIB through Anchor Link and the Vice President of Finance, Kathleen Bond, will contact you with further details.